Log These pathetically ugly creatures were created in X-Naut laboratories. With Mini-Yux around them, they're impervious to all attacks. That's a Yux. Says here it's a creature created in the X-Naut labs. Max HP is 3, Attack is 2, and Defense is 0. According to this, attacks and items won't affect it if it has Mini-Yux around it. So, if any Mini-Yux appear, take those out first. Duh! Yuxes are X-shaped creatures created by the X-Naut army, appearing in Paper Mario: The Thousand-Year Door. They are first encountered in the Great Tree where they are used as security by the X-Nauts. A smaller number appear later in the X-Naut Fortress on the Moon. In battle, Yuxes produce a Mini-Yux from within themselves at the end of every turn; the Mini-Yux sustains a barrier around the Yux that renders it invincible. The Yuxes attack with ring beam that pierces defense; even Damage Dodge badges have no effect on the damage they deal. This means that a Yux's attack will always deal at least one damage unless the target performs a successful Superguard. Another Paper Mario: The Thousand-Year Door creature known as Grodus X also resemble Yuxes. 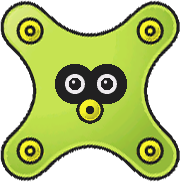 These smaller creatures are also green and cross-shaped (though with smaller arms), but they act more like Mini-Yux, and provide a lesser defense enhancement to their creator, Sir Grodus. Similar creatures called Barribads appear in the sequel title Super Paper Mario; these creatures resemble Yuxes in their facial appearance and their use of protective barriers. In addition, one of the Sammer Guy warriors of Sammer's Kingdom is named Yowling Yux in tribute to the enemy. This page was last edited on October 23, 2018, at 13:09.